Surprise a loved one or a group for Easter with this sweet gift. 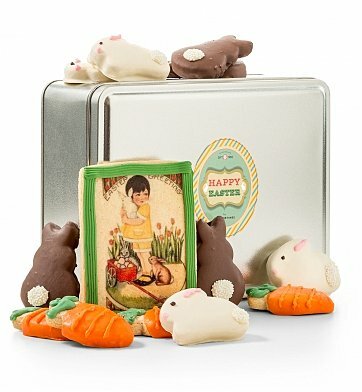 Twelve shortbread bunny and carrot cookies are dipped and decorated for Easter, while a shortbread Easter postcard with a vintage-inspired design completes the gift. Twelve (12) Shortbread Bunny and Carrot Cookies. One Vintage-Inspired Shortbread Easter Cookie. Arrives presentation-ready in a GiftTree tin. Your gift is securely wrapped to safeguard the shipping process and arrives presentation-ready in a gift tin. A complimentary card with your personal message is included with your gift. Measures 8" x 6" x 3". Chocolate Shortbread Easter Cookies is a hand delivered gift. These gifts are delivered by one of our local design centers located throughout the United States and Canada. Same day delivery is available for most gifts when ordered before the cutoff time. The cutoff time for Chocolate Shortbread Easter Cookies is in the recipient's time zone. A dozen chocolate covered springtime shortbread cookies are joined with a shortbread Easter postcard, making a sweet, shareable treat.